mmsonline.com December 2016 MMS 135 SYSTEMS AND SOFTWARE chip control. Suppor ted processes have also been expanded to include key way broaching, band sawing and gear machining, such as cylin- drical and face hobbing. Third Wave Systems, call 952-832-5515 or visit thirdwavesys.com. 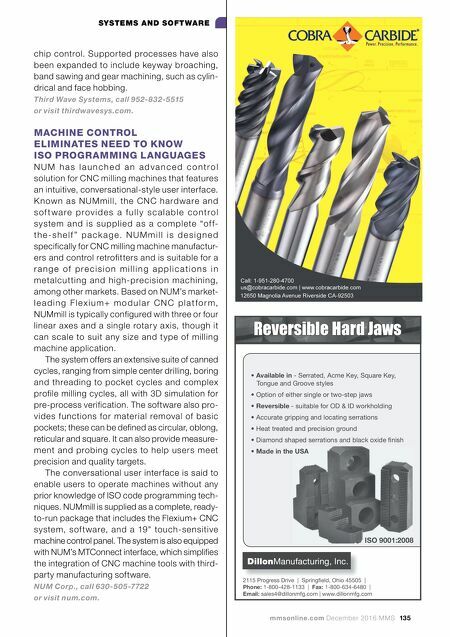 MACHINE CONTROL ELIMINATES NEED TO KNOW ISO PROGRAMMING LANGUAGES N U M h a s l a u n c h e d a n a d v a n c e d c o n t r o l solution for CNC milling machines that features an intuitive, conversational-style user interface. K n ow n a s N U M m ill, th e CN C h a rd wa re a nd s o f t w a r e p r o v i d e s a f u l l y s c a l a b l e c o n t r o l sys te m a n d i s s u p p l i e d a s a c o m p l ete "of f- t h e - s h e l f " p a c k a g e . N U M m i l l i s d e s i g n e d specifically for CNC milling machine manufactur- ers and control retrofitters and is suitable for a r a n g e o f p r e c i s i o n m i l l i n g a p p l i c a t i o n s i n metalcut ting a nd high-pre cision machining, among other markets. Based on NUM's market- l e a d i n g F l e x i u m + m o d u l a r C N C p l a t f o r m , NUMmill is typically configured with three or four linear a xes and a single rotar y a xis, though it can scale to suit any size and t ype of milling machine application. 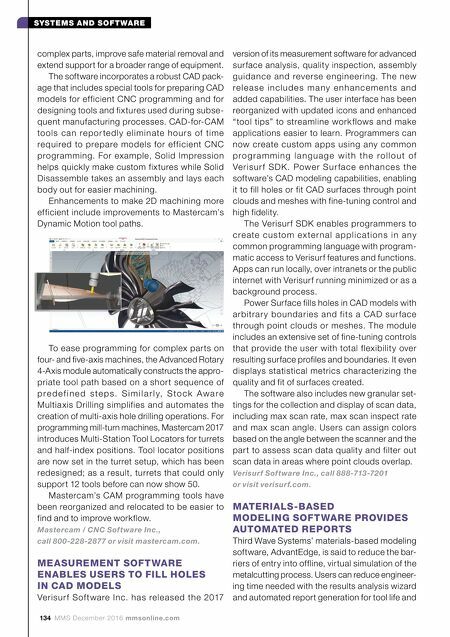 The system offers an extensive suite of canned cycles, ranging from simple center drilling, boring and threading to pocket cycles and complex profile milling cycles, all with 3D simulation for pre-process verification. The software also pro- vides functions for material removal of basic pockets; these can be defined as circular, oblong, reticular and square. It can also provide measure- ment and probing cycles to help users meet precision and quality targets. The conversational user interface is said to enable users to operate machines without any prior knowledge of ISO code programming tech- niques. NUMmill is supplied as a complete, ready- to-run package that includes the Flexium+ CNC system, sof t ware, and a 19" touch-sensitive machine control panel. The system is also equipped with NUM's MTConnect interface, which simplifies the integration of CNC machine tools with third- party manufacturing software. NUM Corp., call 630-505-7722 or visit num.com. 2115 Progress Drive | Springfi eld, Ohio 45505 | Phone: 1-800-428-1133 | Fax: 1-800-634-6480 | Email: sales4@dillonmfg.com | www.dillonmfg.com Reversible Hard Jaws ISO 9001:2008 • Available in - Serrated, Acme Key, Square Key, Tongue and Groove styles • Option of either single or two-step jaws • Reversible - suitable for OD & ID workholding • Accurate gripping and locating serrations • Heat treated and precision ground • Diamond shaped serrations and black oxide fi nish • Made in the USA | DillonManufacturing, Inc.